Since its establishment, Romco focuses on providing excellent service to its regional customers in various spheres of activities. Customer service is an integral part of Romco expertise and know-how. Our qualified personnel are devoted to guaranteeing a fulfilling experience that targets needs and meets the expectations of our customers. As part of its service, Romco offers in house training programs in partnership with its main suppliers. 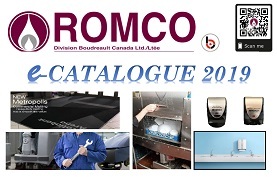 Romco and its suppliers team up to provide its customers with expert advice on the use of their products. Romco offers custom entrance matting solutions and installations. Online ordering is now easily accessible from your computer, tablet or even your mobile device. Ordering history and statements of account are available on your online account. For a more personalized service, your representative will meet with you or will contact you and assist you in making your orders. Deliveries are free for orders of $150.00 or more. For orders under $150.00 before taxes, there is a delivery charge of $20.00. Montreal deliveries are subject to a minimum $5000.00 order before taxes.